SPRING CLEANING SALE - 10% OFF + FREE Shipping* + 2X Bullseye Bucks! *Some items excluded. Can be combined with free ground shipping on orders $150+, to contiguous US. Expires 4/25/19, @ 3:00 a.m. EST. 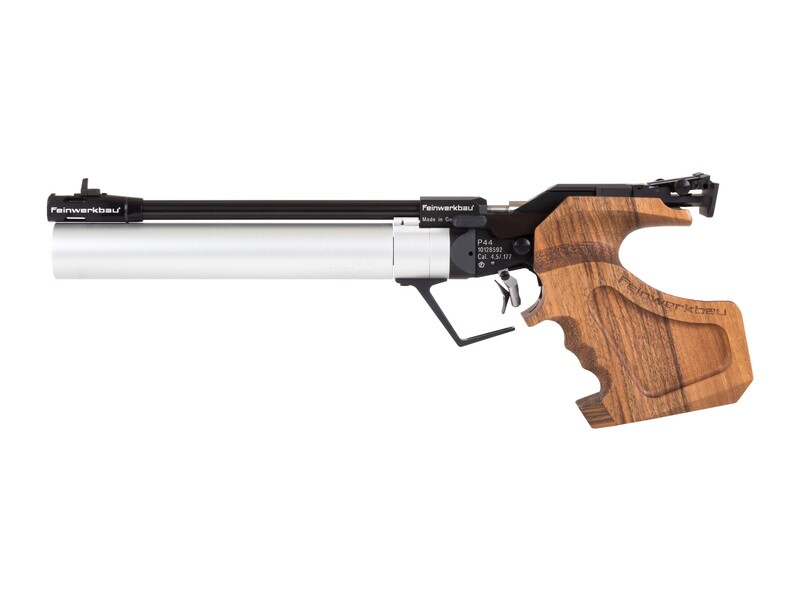 The FWB P44 air pistol is THE pistol to beat in 10-meter competition. Whether you're right- or left-handed, we've got the correct configuration. 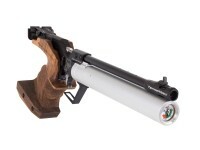 This gun is highly adjustable and extremely accurate. 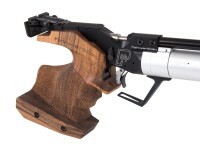 If you have Olympic aspirations, this gun will take you there! Things I liked: Absolute delight to shoot. Extremely smooth action and accuracy. 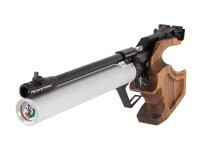 Expensive, but you will not a better pistol. This is in a class by itself. If this, with all of its adjustments, does not make you a better marksman you either need new glasses or a different hobby. Things I would have changed: Nothing on the pistol. The price should include an extra cylinder. What others should know: While there are several good pistols on Pyramids website, save your money if you really want the best. It with save you more in the long run. Things I liked: Everything. There is nothing bad I can say. There are adjustments for everything imaginable. The gun is well balanced, comfortable and the easiest gun I have ever shot. Dry fire feature is fantastic. I practice all the time. Things I would have changed: Should come with an extra cylinder although, you do get a number of shots off the one. Well over a hundred shots and shots are good right down to low levels on the cylinder. What others should know: Awesome gun. 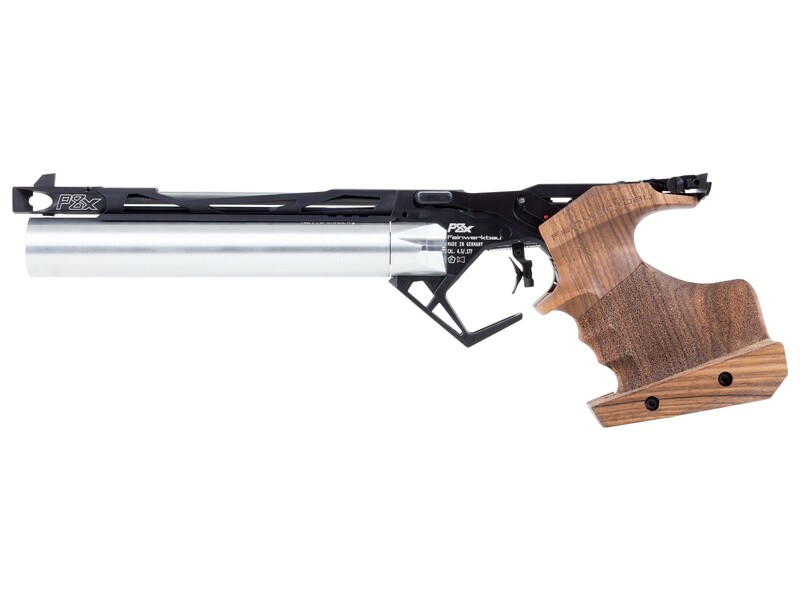 Things I liked: This gun is for world class competition, and is on a par with the Steyr LP 10 and the Morini 162. Full adjustment capabilities. 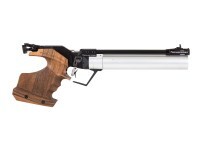 Trigger: take-up and let-off weight, length of pull, angle and height of trigger shoe. Sights: rear windage,elevation and width of notch, front: different widths are available. Sight radius can be changed. Grip: wrist angle and left/right bias can be introduced. Safety button also engages dry fire function. Loading channel feeds directly into breech (no fidgeting with pellets). Balance and weight of gun can be altered by addition of optional weights. Note, they have clearance over barrel, no contact. Barrel vented to minimize muzzle flip. The trigger is the best of any target pistol I have ever shot, clean, precise with no over-travel or creep. Things I would have changed: The gun comes with only one air cylinder. A second will cost you $269. In the past guns came with 2 cylinders. At $1,700 it should be included, but gun is still worth it. This is why I gave it 4 stars for value (as I would with any of the other guns I noted above if they only came with 1 air cylinder). 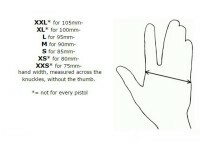 What others should know: I have small hands and the medium left grip fits me so well I need not modify it!!! So far I have used 7 grain R 10 pellets, and Crosman Premier Super Match 7.9 grain .177 pellets with excellent results. I will try the R 10 8.2 grain next. Included are tools for making the numerous adjustments. The gun I received was black with a dark walnut grip BEAUTIFUL!!! This is different than the bluish gray color of the gun on the Pyramyd Air and other websites. 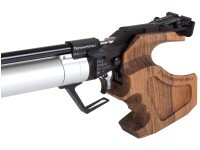 I find the gun to be a beautiful combination of function, industrial design, and art. Based on my experience with two other Feinwerkbau pistols (a Model 90 and a P55 repeater, I expect this gun to last at least 20 years. John, you say you have small hands, but that the medium grip fits perfectly. Should I infer that the grips are somewhat undersized compared to other makes, such as Morini, Steyr, or Rink grips? Unable to find cylinder size. Max fill pressure is 200 BAR (2900 psi). Regulators on these guns are usually set in the 70-80 BAR range. Full fills to 2900 psi, if your tank started with 3000 psi, you'd get about 10 full fills of the pistol cylinder. In terms of usable fills (let's say filling to 2500 psi), you'd get well over 50 fills. 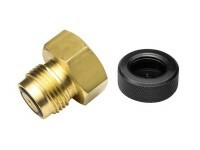 1- is a large size RH grip available with initial purchase? 2-is an extra cylinder available, and if so, how much? 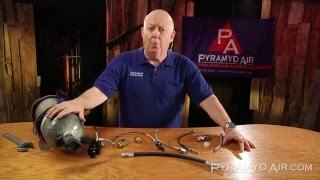 Give Pyramyd a call, they should be able to get that info for you. Does this P44 comes with an extra spare air cylinder?